Same here: everything integrate perfect with my Symfony2 project (command line tool, etc.) except the framework view. My bundles, entities, controllers, etc. simply don't show in the framework tool window. In Settings/PHP/Framework integration, where Symfony2 is enabled as the project framework, elements in the tree view MUST be populated. Then it is indexed and elements (entities, controllers, etc.) are now listed in the appropriate folder. 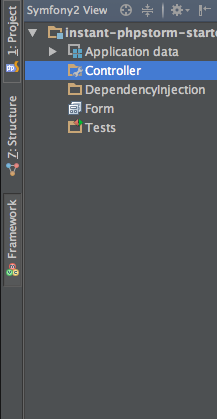 This was pretty simple, but I cannot remember doing this in PHPStorm 6 (did the framework integration do it for me? ).